Extruded pieces of rubber line the two vertical and three base pieces offering the greatest protection to finished material. 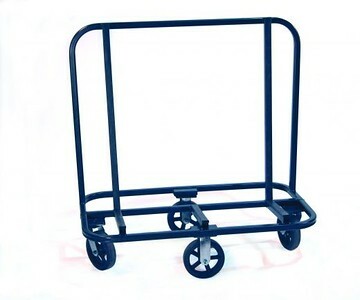 Center 8 inch x 2 inch (20.32 cm by 5.08 cm) wheels are rigid with end wheels that swivel offers great maneuverability. It can spin 360 degrees in place and negotiate tight corners. Unit is ideal for use in the shop or at jobsite.